Did any of you happen to see the cover of this week's FOODDay section in The Oregonian? Well, if not you can read the article here online. 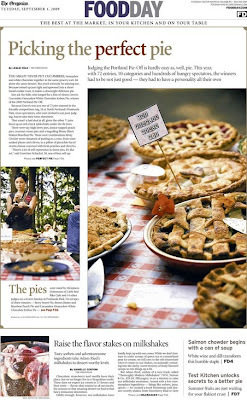 And for those of you that did happen to catch it, no, that wasn't your eyes deceiving you, that was a HUGE write-up on this year's Portland Pie-Off featuring the cafe's own Ali Jepson on the cover, looking ever so pensive contemplating all-things-pie. Here's the part where we reiterate just how much fun this event was and what lucky ducks we were for being part of it. 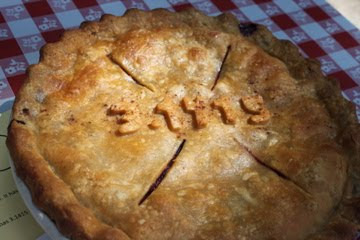 Thanks again to the Pie Commissioners who left no stone unturned, or plate empty, at this year's celebration. We salute you in your quest to bring people together thru pie. Mission accomplished! In an attempt to pay it forward, we're happy to announce that we'll be debuting Alison Greco's winning pie this Sunday Brunch at the cafe. And to those of you who can't make it in to the cafe, and/or do not live in the lovely state of Oregon (poor souls! ), we're pleased to pass on Alison's award winning recipe to you so that you may attempt blue-ribbon fame in your own test-kitchens at home. To make sorbet: In a blender or food processor that has been fitted with a metal blade, combine honeydew, cucumber, sugar, corn syrup and lime juice. Pulse to chop, then process until thick and smooth. Place in ice cream maker and freeze according to manufacturer's instructions. Place in freezer to ripen while you make the crust and pudding. To make crust: Preheat oven to 375 degrees. In a small bowl, combine shortbread crumbs and butter and blend well. Press into the bottom and up the sides of a 9-inch pie plate. Bake for 8 to 10 minutes or until crust is lightly browned. Cool on wire rack before filling. To make pudding: Place 2 cups milk and salt in a medium, heavy-bottomed saucepan. Sprinkle sugar on milk and do not stir; heat over medium-high. In a small bowl quickly combine cornstarch with remaining 1/2 cup milk; add egg yolks and mix well. When milk mixture comes to a full boil, remove saucepan from heat and stir in cornstarch mixture (pudding will begin to thicken). Return to heat and cook, stirring continuously, for 1 minute. Remove from heat, stir in vanilla, butter and white chocolate chips. Place plastic wrap on surface and chill in refrigerator until cool. Spread 2 cups chilled pudding in crust (strain the pudding through a wire mesh strainer if lumps have formed). Place pie in freezer until pudding hardens, about 45 to 60 minutes. About 20 minutes before taking pie out of freezer, remove sorbet from freezer and allow to soften until spreadable. Spread softened sorbet over pudding. Return to freezer until solid, at least an hour. For best flavor, thaw slightly before slicing, so pie is easy to cut but not melted and sloppy. Oh no! I missed the pie....I got behind on my blog reading and didn't read your post in time. Will you be serving it again?